Decks can be great outdoor spaces to get together with friends and family or to just enjoy a beautiful day. When it comes to maintenance and aesthetics, though, decks can be difficult to manage. Many homeowners may believe the only option they have is to continually stain and seal the deck to keep it looking and performing well. That is not the case. Pebble paving is a wonderful alternative to stain that will last longer and will require less maintenance. Even the best deck stain will show signs of weathering. 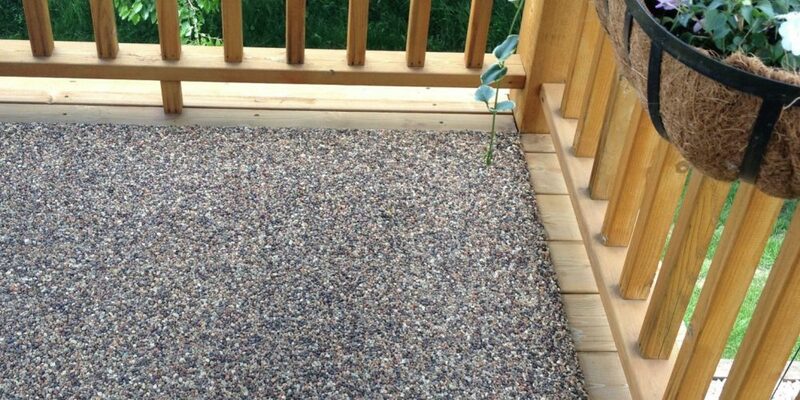 With pebble paving, your deck will maintain its beauty much longer than stain. The inclusion of epoxies in Lusterstone help block environmental factors that can extend the life of your deck! While stain comes in a variety of colors, it does not offer the same aesthetic value of pebble paving. Lusterstone offers several color choices, as well as borders that can set your deck apart. Pebble paving can essentially turn a standard deck into a luxurious outdoor living space, simply by giving it a surface that offers a clean, distinguished visual appearance. Not to say that deck stain can’t be done professionally, but for most homeowners, hiring someone every year to stain your deck can be an expensive undertaking. Working with Lusterstone, you will know that a professional is responsible for installing your deck upgrade. Finishing your deck with pebble paving instead of stain is the right choice for a number of reasons, but to really understand why you should choose pebble paving, visit our pebble paving gallery to see the results for yourself. At Lusterstone, you can count on a great product and great service that will stand the test of time.